If you’re planning a New Year’s party and want to serve some finger food for your guests to offset the champagne, here’s a deceptively easy recipe that combines creamy polenta with flavorful roasted mushrooms. I’m always surprised when people ask if I make my polenta from scratch—because what else would you do? It’s easy; just like making Cream of Wheat. When buying mushrooms, I look for them to be clean and white and all about the same size—about one bite each—so they will cook at the same rate. If the crimini mushrooms are smaller, I will buy those instead. Preheat the oven to 400 degrees F. remove the stems from the mushrooms and reserve if they are used in the filling. Use a damp cloth or mushroom brush to clean the mushrooms. Brush each mushroom with the olive oil. Add salt and pepper to taste. Place the mushrooms, cap-side up, on a baking sheet. roast until the mushrooms are golden and their liquid begins to seep from the cavity, 6 to 7 minutes. Place cap-side up on paper towels to drain. Note: If you are planning ahead, you can prep the mushroom caps up to 4 hours ahead and simply store them in an air-tight container. Heat the oven to broil with the rack in the upper position. Meanwhile, place ½ cup of the milk, ½ cup of water, the salt, and ½ teaspoon of the thyme in a medium saucepan. Bring to a boil. Slowly pour in the polenta, whisking constantly. Cook, stirring, about 2 minutes, until the polenta thickens. Stir in all but 2 tablespoons of the cheese, the remaining milk, and the butter. Using a small spoon, quickly spoon the polenta into the mushroom caps. Garnish each cap with the remaining cheese. Place the caps on a baking sheet. Broil until the cheese is golden, about 1 minute. Garnish with the remaining thyme. Serve hot. Recipe from Martha Stewart’s Hors d’Oeuvres Handbook. 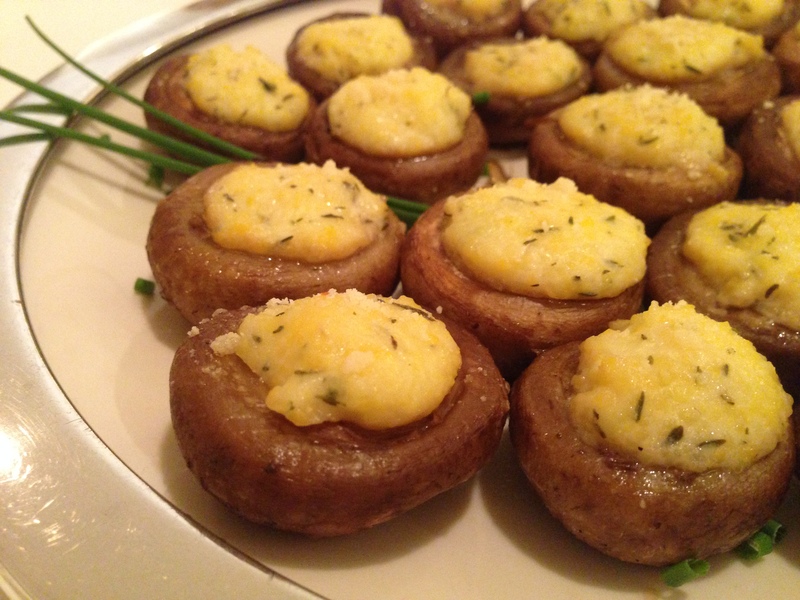 This entry was posted in Appetizers, Recipes and tagged mushrooms, polenta. Bookmark the permalink.